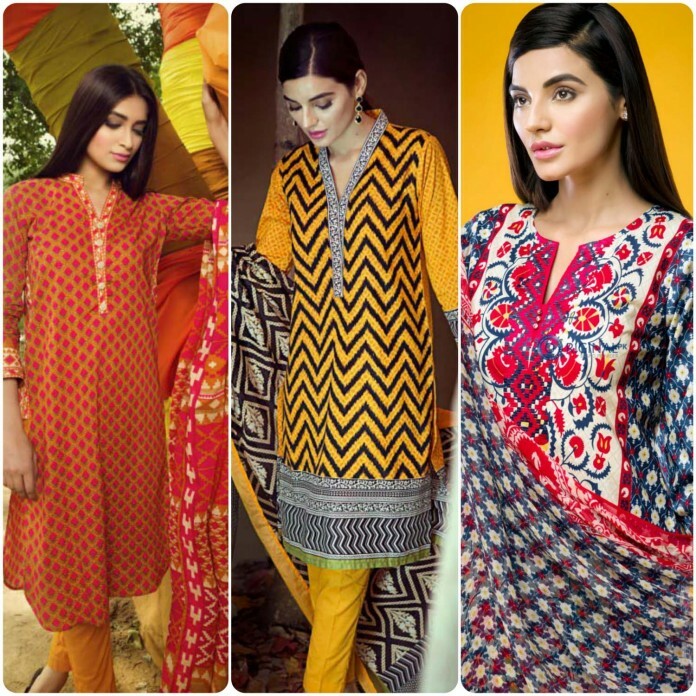 Khaadi is one of famed and leading brand among all other brands, as this brand got fame in no time and the reason behind its fame is for which its sale has doubled for last years, that is its double sided prints, splendid designing, architecture and economical price which is affordable for all people. This made it standard brand among other clothing brands. The khaadi brand along with cloths also deals other things like bags, shoes, jewelry and home made accessories. For these things became famous in all over the world.The embroidered dresses are unique as those are not soled only in Pakistan but also in other countries. Their label publicity force them to open new branches all around, so that’s why their retail outlets are now located in Bangladesh, India, London, Dubai and in different cities of Pakistan. As new season changes women got frustrated that what to wear and how to select new attires for them which make their look gorgeous and stunner. 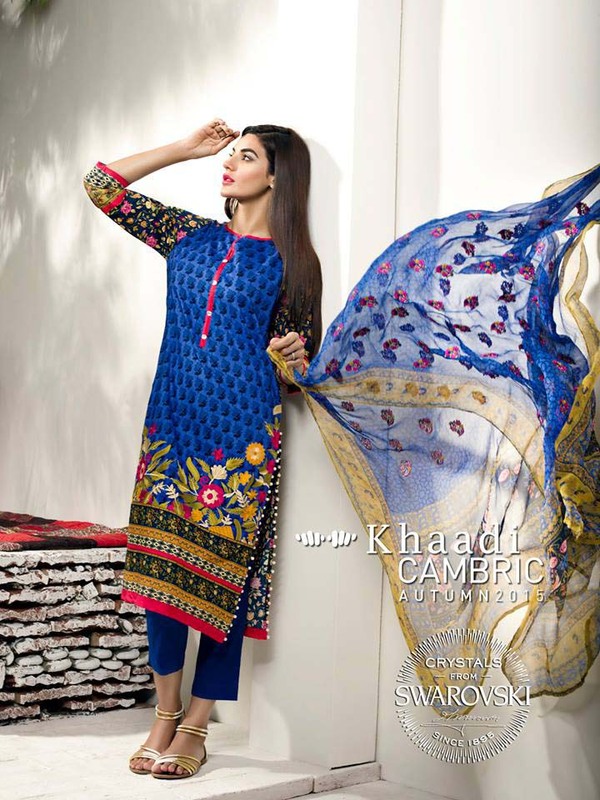 But don’t be panic we are here to solve this problem, we came along with Khaadi Cambric Newest Winter Collection 2015-2016 which is in stores now.Colors which are used in this catalog are very vibrant and cozy. 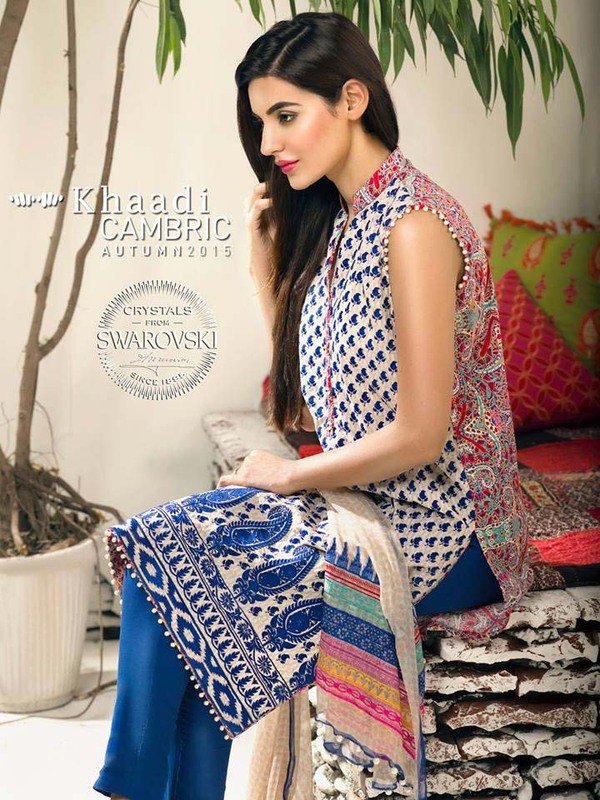 Price range of this khaadi cambric collection starts from PKR Rs. 1750 to PKR Rs. 8000. The khadi cambric Collection is further divided into sub-categories like Elegance in Jewels, Timeless Treasure, Blossom Jewels Flora, Dynamic Folklore etc. Some images of this collection are given beneath. Hey girls! Finally October is here and it is the time when you feel lil bit cold. Ladies are worried about their wardrobe stuff which will b weard in this season. In this season, lawn goes back to wardrobe for next year. 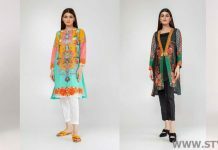 In this season and mostly women like to wear warm cloths which are comfy, like Pashmina, woolen, khaddar and linen, khaadi has introduced its new designs of cambric which is in 4 pieces. In this collection 2 piece and 3 piece suits are available. You can mix match duppatas of your own choice. These shirts can be weard along with trousers and Cigerette Pents. 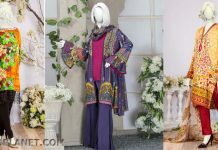 In this Blossom collection consist of four pieces, cotton embroidered suits with chiffon dupattas, swarovski buttons and silk addition.Colors in this assortment are Red, Blue, Mustard, Purple, Orange, Off-white, Maoon, Grey, Green, begie, Black and Yellow.Some prints are colorful and unstitched with floral prints. Dynamic Folklore Collection consist of three-piece prints which colors never fade. Some dazzling prints of this assortment are given below, so have them a look and have happiest winter.